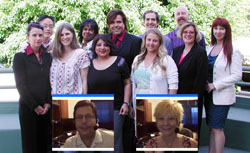 Last Week to Save $200 on NGH Approved Hypnosis Certification Super Course! October 2, 2012 is the last day to save $200 on our upcoming October 2012 NGH Approved Banyan Hypnosis Certification Super Course. To enroll in this course, click here. Our NGH Approved Banyan Hypnosis Certification Super Course is one of the most recognized and respected hypnosis training programs in the world. Learn directly from award winning hypnosis trainer, Cal Banyan, and receive all the training and support you need to become a certified hypnotist or hypnotherapist. You can take this course online or live at our hypnosis center. To learn more about the NGH Approved Banyan Hypnosis Certification Super Course, click here. No other hypnosis training program offers you a better training program or better support after graduation, that's why our grads are so successful. One Reader Comment to Last Week to Save $200 on NGH Approved Hypnosis Certification Super Course! My friend was very interested in getting certified as a hypnotist and I recommended this course to her a couple of weeks ago. I need to remind her she will lose out on the opportunity to save money if she does not act in the next few days. This is a great reminder.